Last night's project, a basket made from old newspaper. After seeing this post at CraftStylish, I was inspired to try one. Maybe I'll keep books and remote controls in it. 1. I cut the folded edge off a couple sections of newspaper and then cut those pages in half lengthwise. I used about 20 pages for this basket (about 40 strips). My rotary cutter and cutting mat made short work of the cutting. Recommended if you have one. 2. 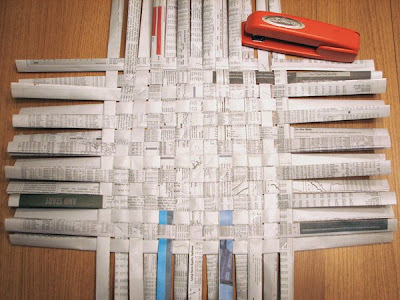 Fold the newspaper pieces in half lengthwise, then again lengthwise into quarters, then into eighths, so you have some sturdy strips. Mine were 3/4" wide. If you want to use fewer, wider strips, use the whole newspaper sheet. Obviously you can adjust the size of your strips. 3. Start weaving from the center outward. Use staples (or glue dots, double-sided tape, etc.) where needed to secure your pieces, especially on the first few strips you put together. You can remove the staples after the basket is finished if you think they're too hideous to bear. 4. When you decide your bottom is big enough (your basket's bottom, that is; I'm sure most of us think our own bottom is plenty large), fold your exposed strips upward at a 90º angle to form the sides. Start weaving in horizontal strips to fill in the sides, securing the ends with staples as you go. 5. When you reach the top, fold the vertical strips over to the inside and secure them with staples, or cut them off. I stapled another strip around the circumference of the top, folded over the rim, to hide the ugly ends. You could use glue or double-sided tape for this if you don't want to see staples. Isn't that going to get newsprint ink all over? Maybe you could spray it with sealer (like for charcoal drawings) or lacquer or something? i love this concept and yours turned out so well! honestly i think your basket is better looking than the recycled newspaper containers you can find at the container store. and yours is handmade! Did you have black fingers when you got done? Lisa, just use a scissors. The cuts don't even have to be perfectly straight because you'll fold it up anyhow. And my fingers were kinda gray, not completely black. :) It washed off easily, thank goodness. ooooh it looks so great! awesome! i think i might be able to handle that! I'm going to have to get some newspapers so I can make one or two of those. Totally cute. love your "office space" stapler. That is the coolest! Got to try it for myself. What a fab idea! Thanks! Stop by my blog, A Purse Full of Cheerios, and enter the contest for a free COACH bag! Hee hee! I was giggling about my big bottom before I even got to your "clarification." :) Very cute idea! fun! It looks great Jess! Love it! Great use for your orange stapler. I love the recycling. You did a great job! Aw I made those in Ele school! I'd like to try covering the finished thing in Mod Podge to see if it could be more permanent. I can't wait to try this! Thanks for the great instructions! Just found your blog and I love all these fantastic ideas, i'm going to be very busy trying them all out! That's totally awesome! I'll have to try it out. This project looks like a great summer project! I just read your June 8 "My New Life" entry - sounds perfect! This looks great! Is there a coating you can spray on to prevent the newspaper ink from rubbing onto other surfaces? I'm sorry I missed out on the fun :-) Looks great! Maybe I'll make one for my mom while I'm down here. My name is Tracy Jackson, I'm the Affiliate Manager here at Fabric.com. I found your blog today, and was quite impressed. I have a special gift for you and your readers. At your convenience please call me at 1-888-455-2940 ext. 214 or you can email me at tracy@fabric.com. Thank you "sew" much for your time. I hope to hear from you soon. that's remarkable! I wonder if I can make that?? Will have to try and report back. Brilliant idea! Lovely result! Can't wait to try it out! This is fun. I may have to try this!! These are the times that I wish that I weren't totally incompetent at crafts and the like. That is great, i love it! I've done a similar project 10 years ago, but I use brown paper bags. It is STILL very sturdy - I have even wash it down once and let it air dry. With mine, I added handles with large brads. Sounds very cool! Hmm, now I gotta try the paper bags! I wish I lived near you. I need such a talented friend who can make such amazing stuff. You have patience I do not, the inspiration I'm in want of, and of course, the vision I completely lack. Thanks for sharing. this is fabulous. it gives me an idea using paper shopping bags. i have so many and i don't want to throw them out, they are very nice. this could work. LOVE this idea. Wonder if I could make a really, really big one to store recent newspapers in! If you roll up a single newspaper sheet really tight, secure with a bit of tape then flatten it, you get a stronger weaving strip, easier than cutting. Try at angles for longer strips. All sorts of basket shapes are possible, start with a diamond bottom for example. Spray paint looks fantastic: I like gold edges. I love this idea! My husband just emailed this to me, what a sweetie. My daughters and daughter-in-law are always trying to come up with "green" ideas for gifts. I'm going to make them each a basket for Christmas! Thanks for the really clear instructions. I assume you meant bare, not bear? I was looking for such a tutorial last week. Can't wait to try it. I'll check out that tutorial; thanks! hey great job! ive been wanting to do this project for the longest time! Wow.. it's really great!! Thanks for giving the craftstylish link. I am definitely going to try this... and, because I have done a few (amateur-level) weaving projects, I think I'll try making it in a custom-sized retangle. Then, make another, just a little bit bigger. And, voilá, with the upside-down bigger one over the first one, I'll have a custom-made gift box! For the "stronger, longer-lasting" aspect, wouldn't it work to paint it lightly with some watered-down white glue? ...or maybe not a "retangle." Maybe a rectangle, instead! Yeah, Denelle, make a retangle! Hee hee. I think watered down white glue or mod podge would work. Try it! Love your basket!! Will print out instructions to make this with my students when school starts again! I immediately went to work upon finding this article, sitting as I was with a stack of newspapers at my feet. Took two hours, and I ran out of tape about 6 inches from the end (of course), but finishing wont take but a moment tomorrow when I get to a store. My dad has been in the newspaper business my whole life, so this is going to be a perfect Father's Day gift! (yes, Father's Day is tomorrow, but he is out of town, so I cant even give it to him yet, so it doesnt matter, right?) Thank you for the inspiration and the how-to! He will be so thrilled! I thought this was a great idea for re-using something everyone has in their homes. Goodness,it looks so great i feel compelled to try it.The instructions do leave me unsure what i should do next but i am neverless going to try making one! The basket looks so cool! I want to make one too! Just wanted to let you know I featured this tutorial and the newspaper flowers in a post all about upcycle crafting. Thanks! hmmm, neat idea, I wonder what things I can use...like twill tape??? I made a smaller one from the pages of a magazine. It is good for containing the contents of my pockets when I get home so that I don't lose them. And it is very colorful. Each strip was made from a full page but I did cut off the scraggly edges. I also made a pointless, much smaller one big enough to fit a quarter in. Experimenting with the sizes of strips. Very Cool, I'm going to try this! Nice blog, This is my first time visiting here. Thank you for this wonderful idea ! Your blog is just awesome. wonderful! looking for a project for the kids for the holidays - this is perfect - no cost, easy, and the end product is so useful. i wonder how many we can make as xmas presents????? what a fantastic idea! Thank you so so much! Wow cool idea! I'll be making one of these for my bedroom, the upstairs office, and our basement office.. my parents get the newspaper daily so I've got a pile about a foot high!!! I'm going to paint the recycling logo onto the outside of the basket, and we'll use it to recycle paper!!! Right now all the paper in our offices just goes in the trash.. eek! 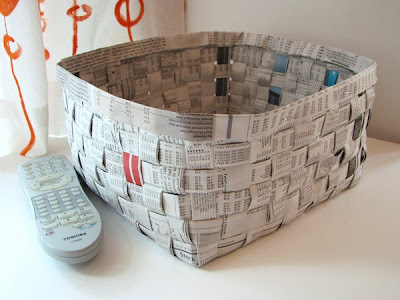 I did a similar basket project but used magazines instead of newspapers. You have to glue to pieces together to make the long strips but its worth the extra bit of work to have colorful baskets. They are pretty strong for just paper. I've seen these in stores like Pier One for upwards of $20. Who knew a little recycling creativity can save so much money and be trendy! I weaved the bottom part, and my strips were about twice the width of yours (i didnt cut the pages in half) and i weaved the bottom to be 8 strips by 10 strips, and there was barely enough room to fold the sides up! did i do something wrong?? i wanna do that myself, im still young so i dont really know how to. but i made something like this in 4th grade so wont be that hard. this is for a science grade in science in my 5th grade class.it is going into a ciriculum fair. so my teacher told us we have to make somehing for our science grade. yea yea so thanks for the idea ! i was going crazy looking for something to do ! A question?.. are they strong enough to hold things that are pretty heavy such as wine bottle or wheat begs? Probably not; the baskets are quite flexible and it seems like you'd want something more rigid. This is a wonderful idea. Now I know what to do with my old magazines. phones as well as old computer parts can now be recycled. Whether it's a papercraft made from recycled or shredded paper, plastic or other kinds of ornaments - the important thing is that you have placed thought and care on your gift. great! sounds fun...except cutting everything by hand haha! To avoid the ink smudging or transferring, just iron the newspaper sheets before using. It's an old trick I picked up from the butler's characters in several movies! Wow, interesting! Thanks for the tip! I like that you watch movies that have butlers in them. Excellent. Sweet! It looks great! thx for the idea! Making a bunch! Awesome!! I cant wait to try it for my parents anniversary!! Can't wait to try this! Thanks!! I just found this project and it was fun to do! I used a credit card to crease the paper (and save some ink on my hands) and double-stick tape (because who the heck knows where my stapler went). My top rim didn't come out as nice as yours, but I enjoyed it overall. thanks! I made one today. I folded the paper up yesterday and today I put it together. I actually had two going at the same time (my son was helping me). I did them two different ways to find the easiest way. It was a bit difficult. I made a mistake at one point. i used a glue stick. Next time I think I will use a stapler, cause I had to unglue some to put one of the sides in. I will do this again, but will learn from my first time. I love the basket. Just gonna add some wide ribbon to the top. Thanks for the TUT. ¡Qué linda manera para hacer canastos y otras cosas! Pertenezco a una comunidad de manualidades donde hacen cosas re lindas también, sin duda podrías aportar todo este conocimiento y habilidad. Espero que quieras unirte! Hi! I just made one using yours as inspiration. I left a link, just so you know. This is awesome. Going to try it with my ELL students! Oh, I just thought, those marvy paper bags with handles where, either the handle or the bag inevitably blows out, reuse that paper. Lot's of it is wonderfully colored. Fabulous idea. I am going to help my. 2 grandchildren each make one for their Mom & Dad's birthdays in the next few weeks. Thank you for the craft and instructions are explained very well. Am I the only one who can't get the sides to work well? Any tips for the spaz? Might try using magazine pages. Wonder how much fun it will be to extend the strips? staple together maybe? I used to make paper twist baskets using standard tissue paper boxes as the base (good use for recycling old tissue boxes, too). It worked well & allowed the new basket to square up nicely. I believe I covered the inside of the tissue box with opened paper twist. Paper twist has a little soft bulk, which hides the base; newspaper doesn't have the same bulk, so you might have to remove the tissue box. If you didn't, perhaps lining it with gift wrap might work. For the handle, I braided the opened twist. I believe you could use a flat braid of newspaper for a handle.